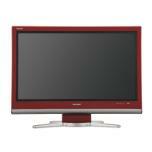 CM DESIGN offers several Sharp Televsions. Please see the list of various models below. Estimated Manufacturers Suggested Retail Prices are listed below. For exact pricing, please contact us at 888-778-1131 or sales@cmdesignsolutions.com. The LC32GP3UR has a striking new design, featuring a thin, "slim-line" body that provides a significantly smaller footprint than previous models, as well as a unique swivel stand for ultimate viewing and gaming flexibility. To complement any living room or game room, this AQUOS 32" model is available in three glossy-finish colours - black, white and dark red. In addition to the new style, the GP3 models also offers special features that enhance the game-playing experience including the exclusive Vyper Drive game mode, which optimizes the picture quality for game playing. The Aquos D64U Series fits a large screen size into incredibly small footprints. The depth of the D64U series is reduced by 30% by changing the layout of the circuits inside the LCD panel. Advanced Super View/Black TFT Panel is utilized to provide 10,000:1 Dynamic-Contrast Ratio with Enhanced Picture Contrast Technology and 4ms response time. Place the TV practically anywhere in the room with a 176 degrees wide viewing angle. 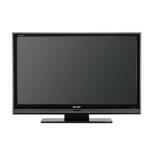 Enhanced Black Level provides the deepest, most accurate black of any flat panel TV. The AQUOS D65U series sets a new standard for large-screen flat-panel TVs. 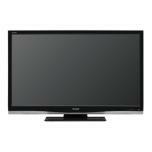 With Full HD 1080p resolution and an elegant new design, it produces a breathtaking picture quality that is second to none. The D65U Series utilizes Sharp's proprietary Advanced Super View/Black TFT Panel with Spectral Contrast Engine, providing high Dynamic Contrast Ratio, 6ms response time and wide viewing angles (176°H x 176°V). All models are HDTVs with built-in ATSC / QAM / NTSC tuners and include 5 HDMI inputs, compatible with 1080p signals, and 2 HD 1080p component video inputs. The D65U Series features a sleek piano black cabinet with subtle recessed bottommounted speakers. The included table stand easily removes for wall mounting applications. 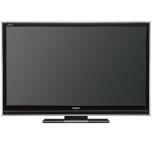 The AQUOS D85U series, in 52" Class (52-1/32" diagonal), 46" Class (45-63/64" diagonal) and 42" Class (42-1/64" diagonal), sets a new standard for large-screen flat-panel TVs. With Full HD 1080p resolution and an elegant new design, it produces a breathtaking picture quality that is second to none. 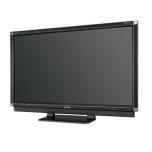 The D85U Series utilizes Sharp's proprietary Advanced Super View/Black TFT Panel with Spectral Contrast Engine, providing high Dynamic Contrast Ratio, 4ms response time and wide viewing angles (176°H x 176°V). In addition, The D85U models include 120HZ Fine Motion Enhanced for the ultimate in fast-motion image processing. All models are HDTVs with built-in ATSC / QAM / NTSC tuners and include 5 HDMI inputs, compatible with 1080p signals, and 2 HD 1080p component video inputs. The D85U Series features a sleek piano black cabinet with subtle recessed bottom-mounted speakers. The included table stand easily removes for wall mounting applications. The AQUOS Special Edition SE94 Series represents the absolute best AQUOS Series ever made. The AQUOS SE94 series features Full HD 1080p resolution (1920 x 1080) and the exclusive "Cornerstone" design for detailed images in a super-thin and light package. Equipped with a 10-Bit panel with over 1 billion colours and 120Hz Fine Motion Advanced for unprecedented picture quality. Plus, with AQUOS Net you can access customizable Internet-based information and unprecedented level of customer service. The AQUOS Special Edition SE94 Series represents the absolute best AQUOS Series ever made. Available in 65", 52" & 46" screen sizes, the AQUOS SE94 series features Full HD 1080p resolution (1920 x 1080) and the exclusive "Cornerstone" design for detailed images in a super-thin and light package. 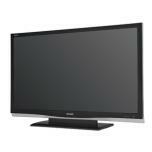 Equipped with a 10-Bit panel with over 1 billion colours and 120Hz Fine Motion Advanced for unprecedented picture quality. Plus, with AQUOS Net you can access customizable Internet-based information and unprecedented level of customer service. Once again, Sharp, a leader in LCD technology, establishes a new design standard for LCD TVs. With a screen size class of 65", the AQUOS® LC65D64U raises the bar by fitting large screen sizes into incredibly small footprints. By changing the layout of circuits inside the LCD panel and by reducing the number of parts, Sharp engineers developed the Slim-line design which reduces depth by 25%, allowing placement of the LC65D64U in virtually any setting.